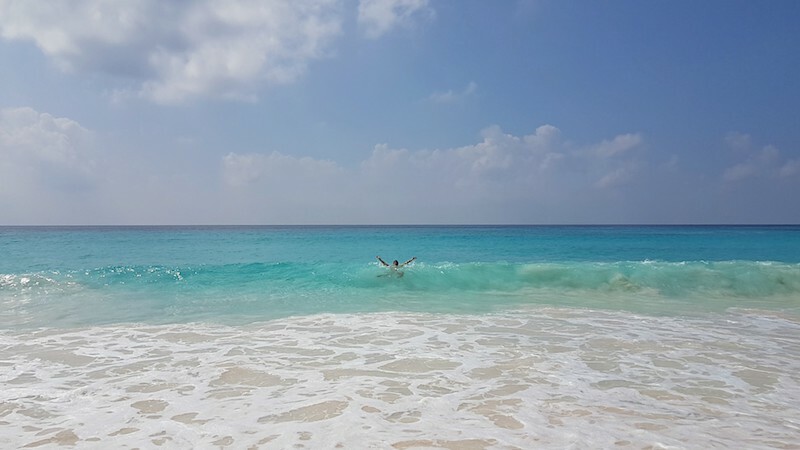 In March, as many of you might have known from my recent blog and social media posts, I traveled to my dream destination for my 40th birthday. That dream destination was the Seychelles, a tiny nation in the Indian Ocean consisting of 115 islands and home to only 89,000 people. 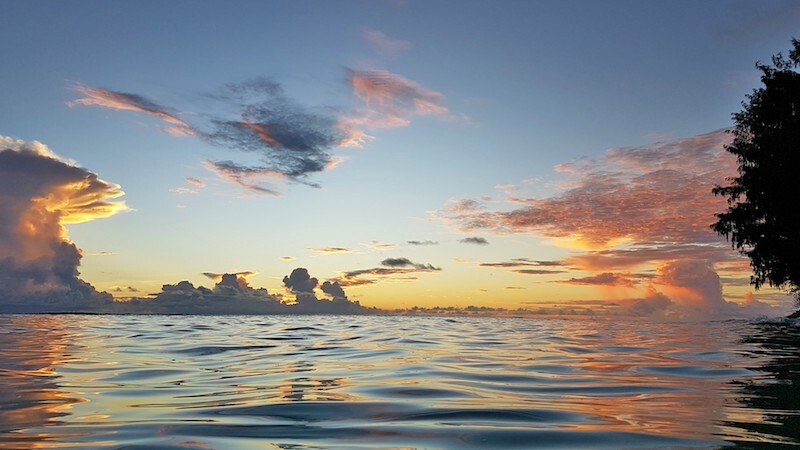 I’ll come right out and say it…if you don’t have a dream destination, make it the Seychelles. Really. 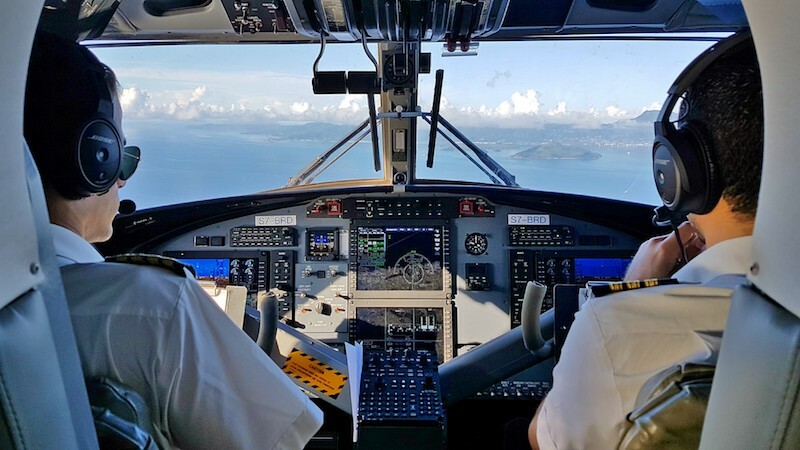 It’s like being in one giant, never-ending fantasy from the moment your plane begins its final descent and little islands start appearing down below. This place is tropical paradise in every sense. 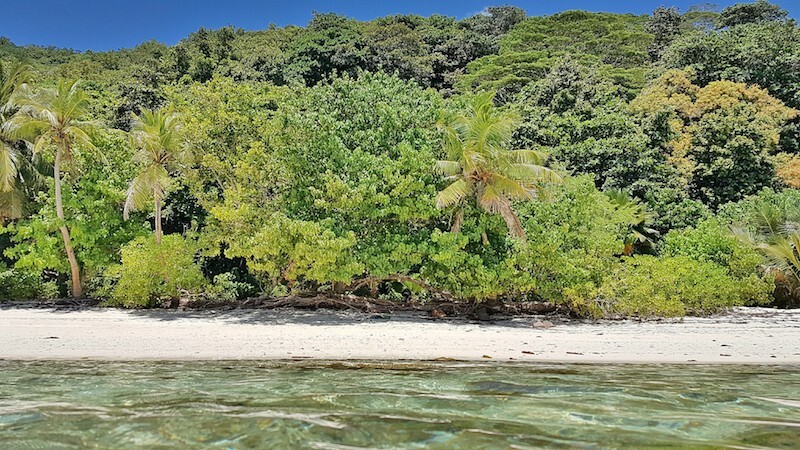 I’ve never seen a paradise quite like this, with perfect, and I mean PERFECT, white-sand beaches everywhere, and I mean EVERYWHERE, with gorgeous, lush jungle covering the semi-mountainous island interiors, and a truly laid-back, we’re in the middle-of-nowhere island vibe. So, how do I talk about the Seychelles? I could write a lengthy guide, but I don’t think it’s necessary. I’m just going to give you the main details of how you can visit this destination for far less money than you probably imagine. After that there are photos, plenty of photos below, that will take you on a journey through this paradise! The main island is Mahe. It’s the largest and most built up and this is where the main airport is located. We only spent 1 night here as we were more interested in the smaller islands that are home to some of the best beaches but it was still splendid. 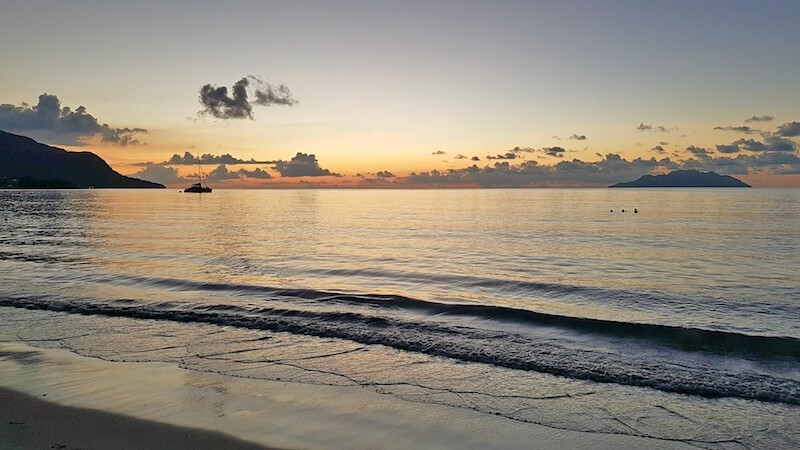 We spent the evening in Beau Vallon, watching the sunset from the beach, and realizing that, holy crap, we were actually in the Seychelles. The second largest island is Praslin, and it’s small, at only 38 square kilometers and with only 7500 residents. Its interior is all jungle (some of the most spectacular I’ve ever seen) and its beaches range from beautiful to unbelievably mind-blowingly beautiful. 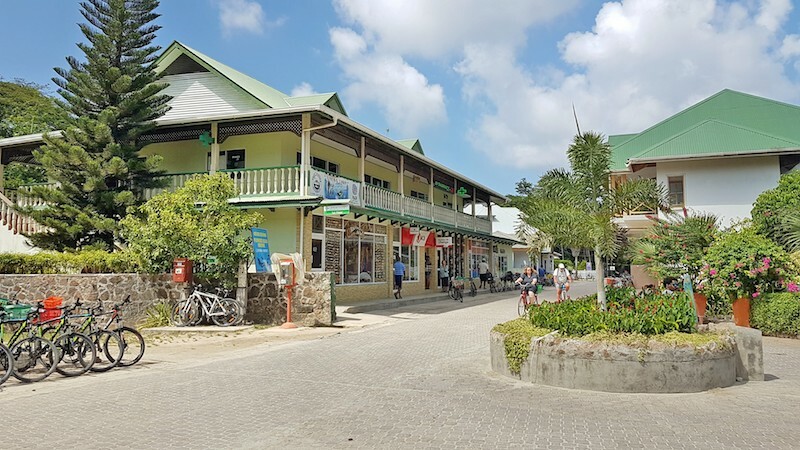 There’s also a good amount of places to eat, lots of shops to buy supplies and it’s an easy island to rent a car to buzz around. The third main island is La Digue and this island is a mere speck. There’s only 1800 people living on it and apart from a handful of cars, everyone gets around on bicycle. You can bike across the island in less than 20 minutes. It’s also gorgeous in every way imaginable. The beaches were some of the most dazzling and exquisite beaches I’ve ever stepped foot on during my years of travel. (More about that below.) 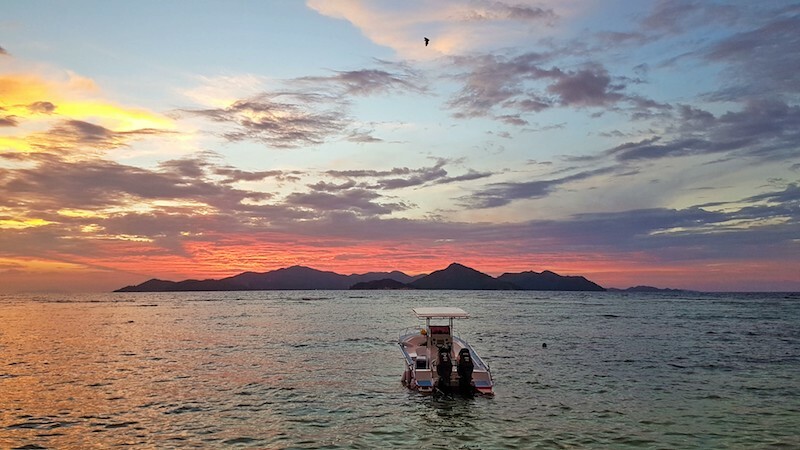 The atmosphere was also supremely laid-back and everywhere you looked was another breathtaking view, whether it be of white sand, turquoise water, thick jungle or other islands in the distance. There are plenty of other islands too. You can see them everywhere. For our 12 day trip though, we stuck to the above three. 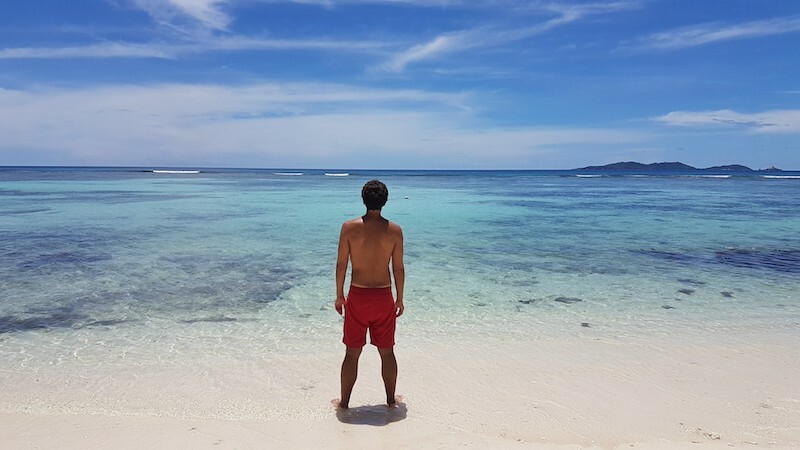 The Seychelles is the kind of destination that is, without a doubt, worth every single dollar or euro or pound or kroner you spend on your trip. Of course, you still want to make sure you don’t spend all of your money and if you can do it all on a budget, then even better! When I started thinking about a trip to the Seychelles, I assumed this country would be cost-prohibitive for anyone but the wealthiest segment of society. Luckily, this turned out to be completely wrong and so I continued planning. Is it a cheap destination? Not at all. But it doesn’t have to be insanely expensive either. Flights: From North America, airfare can range from $800 – $1500 USD. From Europe, on certain charter airlines, you can apparently fly here for as low as 600 Euros return at times. You could also get creative. 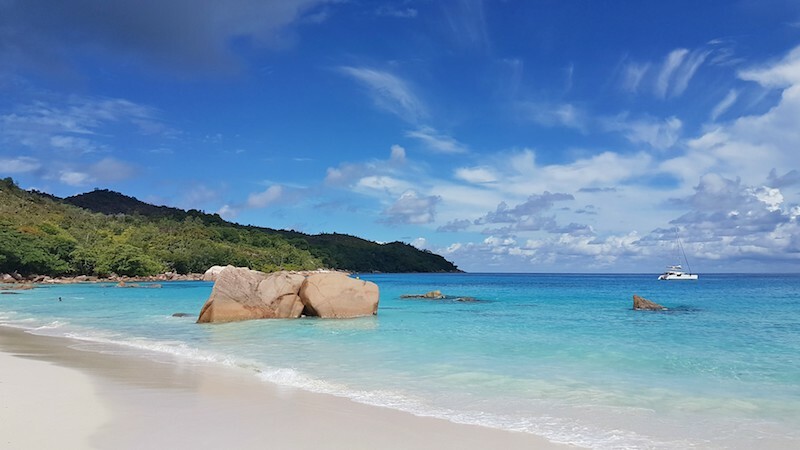 Flights from Dubai, Qatar and even Nairobi to the Seychelles can be cheap so you could find an inexpensive flight to one of those locations and then another flight onward to the Seychelles. 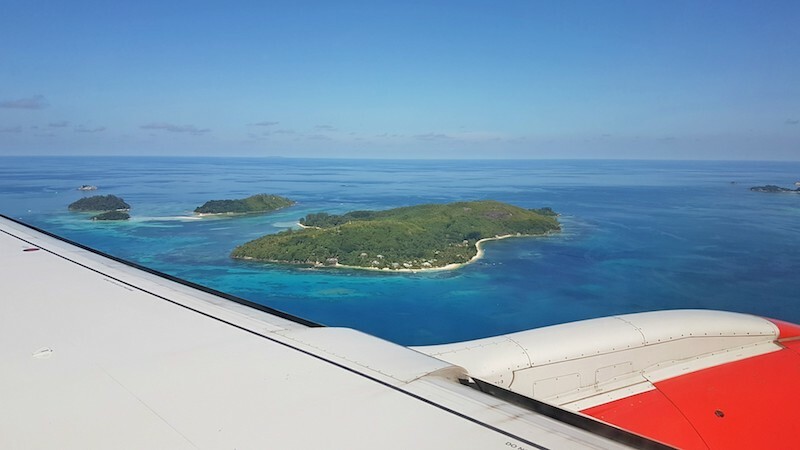 We flew from Nairobi to Seychelles for a mere $150 USD one way. 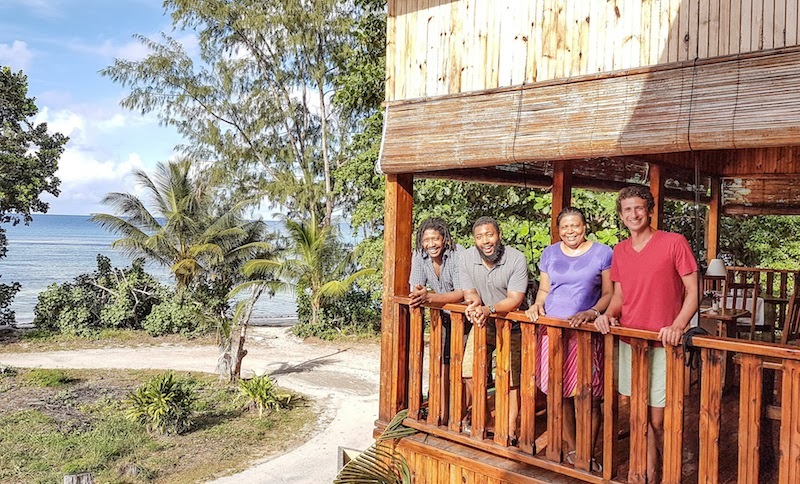 Accommodation: You can book a room on Mahe, Praslin or La Digue for as little as $50 USD per night (simple rooms in simple guesthouses) and you can book rooms for $2000 per night, and everywhere in between. As an example, on Praslin Island, we stayed at the excellent Villa Anse La Blague for 5 nights. 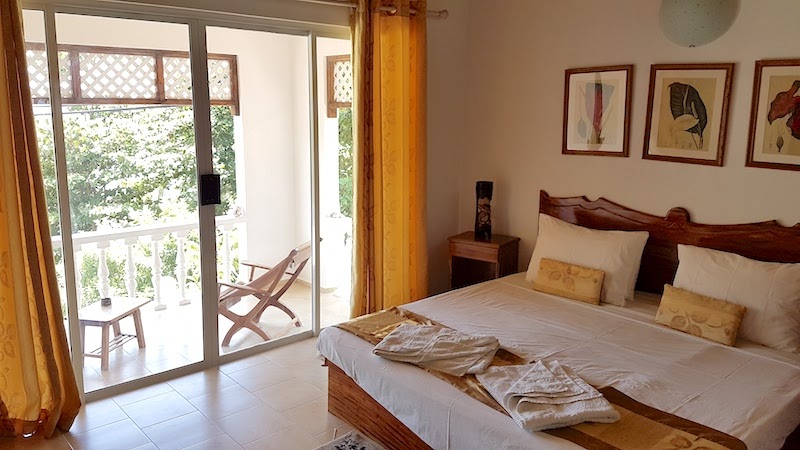 For around $120 USD per night, the rooms were super comfortable, the large balcony had a sea view, the local family running the place were amazing people and the food that came out of their kitchen was some of the best we had in the Seychelles. A great breakfast was included too. 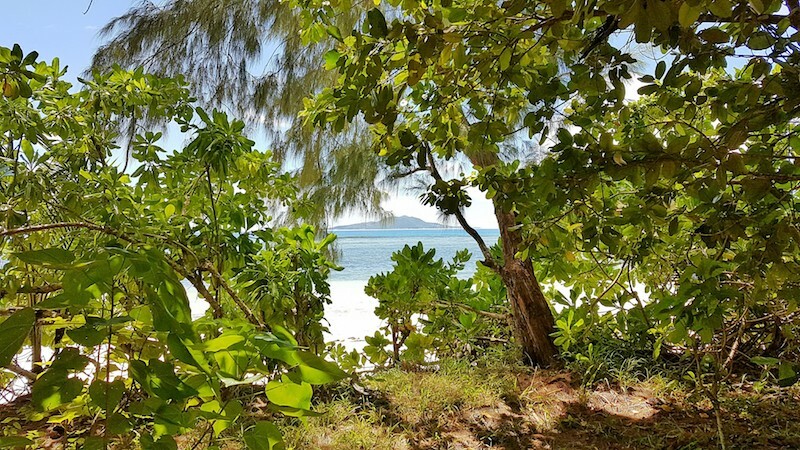 The Villa was also located in a quiet, secluded corner of the island, only steps away from two awesome beaches, yet it was also only a short distance from everything else we wanted to see on Praslin. 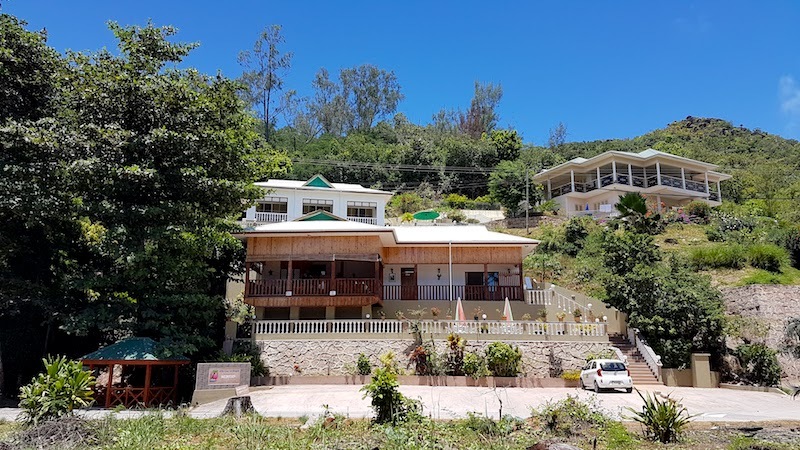 It’s not a hostel price but for what you get, and to be in the remote paradise that is the Seychelles, it’s a great value and very reasonable. Food: Normal sit-down restaurants (nothing fancy) cost about $20 – $30 USD per person. Yes, that’s a little on the pricey side for budget travel. But the three main islands also have plenty of “Take-Aways”, local eateries that cook up a collection of fresh dishes each day. You choose from the dishes in the buffet display and for about $4 or $5 you have a full local meal, usually two mains and some rice and salad. We probably ate at the Take-Aways for 60% of our meals and other restaurants for the remainder. Overall, dining can indeed be cheap here and some of the better food we had was actually from these cheaper options. 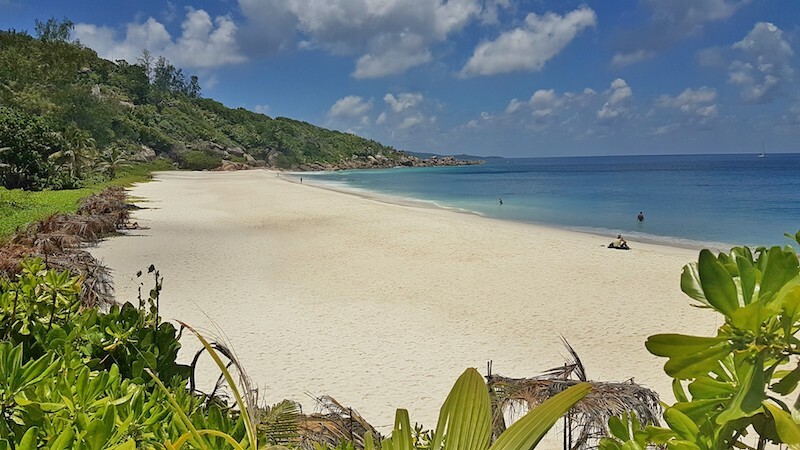 Activities: Beach hopping costs nothing and could keep you busy for weeks in the Seychelles. That’s pretty much how we spent our time. 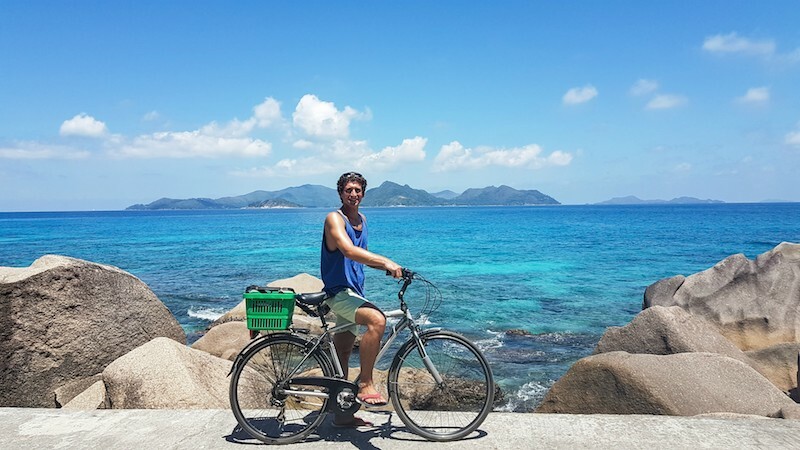 We did rent bicycles on La Digue throughout our stay there ($7 per day) and a car one day on Praslin ($40 USD) but apart from that, it didn’t cost anything to bounce from one unbelievable beach to another unbelievable beach, and then to yet another unbelievable beach. If you want to take a catamaran trip, go fishing, visit some of the outer islands, etc., it will cost around 75 – 200 Euros per person for a half or full day trip. But again, in the 12 days we were there, between the pristine beaches, biking through the jungle and exploring by foot, our days were full and we didn’t have time for anything else. Seychelles is known for the world’s best beaches so if you stick with that, you won’t be spending much money on activities at all. Ferries: To get around the islands, you’ll need to take the ferry. The main ferry company, Cat Cocos, offers twice daily trips from Mahe to La Digue, via Praslin. The cost is about $60 USD per person and it takes 1.5 hours to reach Praslin and another 15 minutes to reach La Digue. Make sure you book your spot in advance though as the ferries do fill up. You can easily book online and print out your tickets. The smaller company, Cat Rose, runs several trips per day between La Digue and Praslin for around $20 USD per person. So that’s the guide. That’s really all you need to know. It’s easy once you get there since the islands are tiny, the people friendly and paradise is literally everywhere you look. And if you haven’t realized it yet, I mean EVERYWHERE! And then the almost too perfect Anse Georgette, which we visited on our final day and which required a decent hike to reach (one of several beaches that are only accessible by foot)…oh yeah I loved this beach! That’s paradise. And it really can be affordable. Any questions? If you need any information about traveling here, just get in touch! Hey Tony – It can be quite hot and humid in March but there’s plenty of beach to visit to cool off at! The islands are all quite small but for snorkeling, most of the good snorkeling requires a boat trip away from the coast. You can easily organize these trips on the island. Based on your itinerary, I would just stay on Praslin and take a day trip to La Digue. There’s no reason to pack up all your stuff, take the ferry to La Digue, check in to a new hotel, only for 1 night. 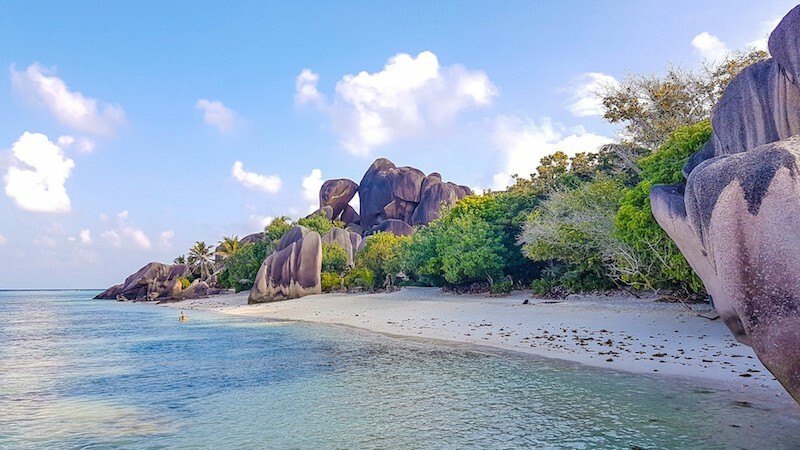 The ferry ride from Praslin is only 15 minutes long so just take a full day trip to La Digue so that you have more time on the island and less hassle taking all of your luggage. Cool. I really liked your post. I live on La Digue some of the time. Have a small house there and every time I am “home” I do not want to leave and go back to work. Plenty of beer as well following on from last post. I also agree cost of living especially if you do have a roof and only buy food. Not expensive at all. So for say, 10 days, it sounds like 2-3k € / person… use credit cards, traveler cheques … best way to pay? Preferred currency = ? You could definitely do it for much less than that! Traveler checks are not a good idea as those are rarely used these days and it’s either very difficult or very expensive to cash them. Credit cards and cash is the way to go over there. If you bring cash, you can exchange dollars or euros into local money. They do require you to show proof of your accommodation and of your flight out of Seychelles. 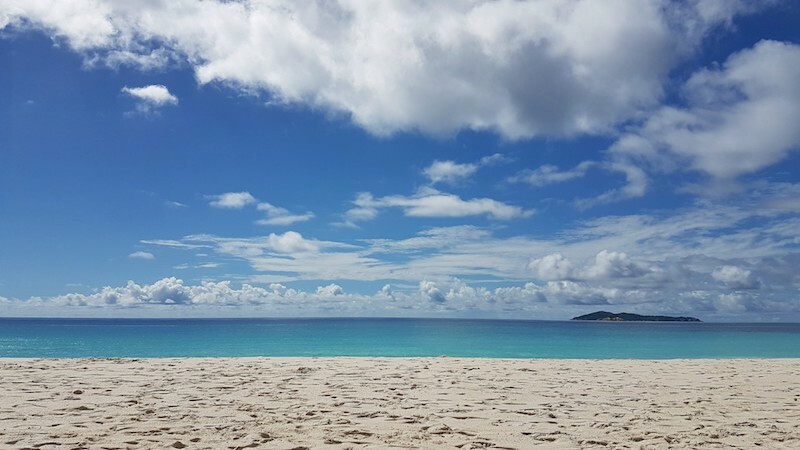 I am planning to go to Seychelles in month of May,2019. How would be the temperature there, would it be hot or humid. May is a nice time to go, with temperatures around 25-30C and not as humid as other periods of the year. Hi Derek..the ferry from mahe to praslin,do we have to prebook or it can be done after reaching mahe? Hey Shyam – It’s better to pre-book this ferry to make sure you get a seat as the ferries do sell out. Thank u Derek..can we do it online? Hi Derek. Thanks for sharing this. It would be great help. Can you please tell me that whats the weather condition in October & November? I am planning to go at November?Thanks in advance. 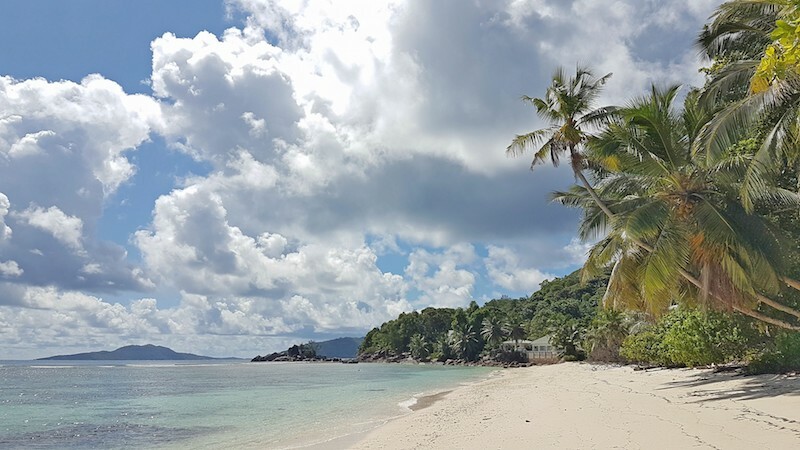 Hey Raisa – The weather is quite consistent in the Seychelles and Oct/Nov is a great time to visit. We are flying already on 23d of June!!! and going to marry there!! So I’ll be happy, if you help us to find the best beach!Please! Hey Daria – Congratulations! 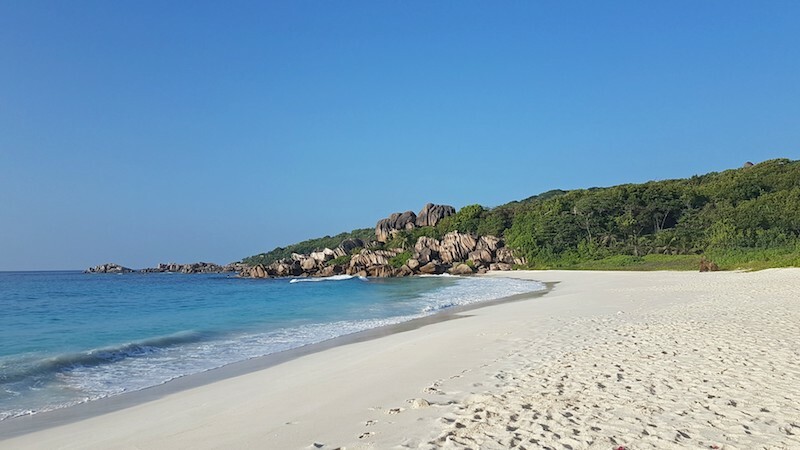 The huge stones are mostly on the most famous beach, Source d’Argent, on the island of La Digue. It has everything you’re looking for although, since it is the most famous, it does get a decent amount of people throughout the day. If you want something quieter, I would choose either Petite Anse or Anse Severe on La Digue or Anse Georgette on Praslin! They aren’t small beaches but they are quiet, gorgeous, have palm trees, powdery white sand and they are usually without many people. 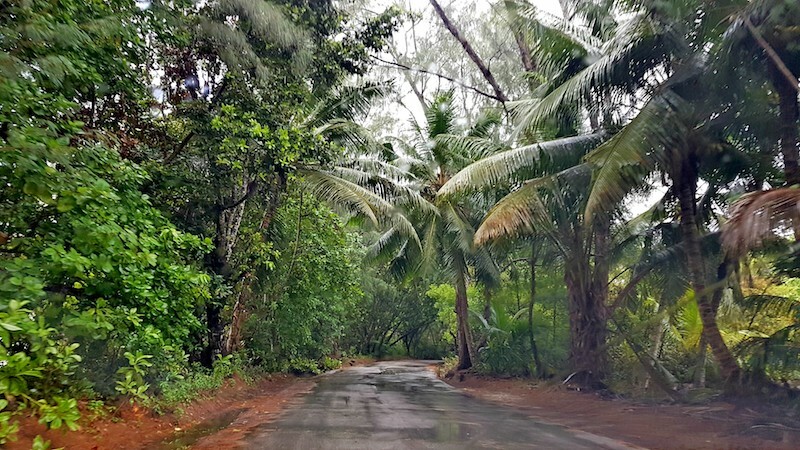 From Mahe, to Praslin and La Digue, the food, fun activities and scenery was mind blowing. You post brings back a lot of fun memories. Would definitely visit again. Thanks Derek. Wonderful post! Am planning a trip to the Seychelles in October, and I can’t wait! On La Digue, can you tell me where you park your bike? For example if you go to Anse Source d’Argent.. Does the rental include a lock? Hey Catherine – Yes, all bike rentals come with a chain lock that you can wrap around the frame/tire. But theft is not exactly an issue on the island as everyone knows everyone and the island is tiny! Hi! Wonderful post. Thank you. Do you think 2 days to travel to and from the island from Johannesburg and then 7 days on the islands is enough? I would like to go to all 3 islands like you did. I can add in more time but I wasn’t sure if I should? How would you recommend the time be split up? I know you said the one night on the main island, but how many split between the other 2 islands would you recommend? 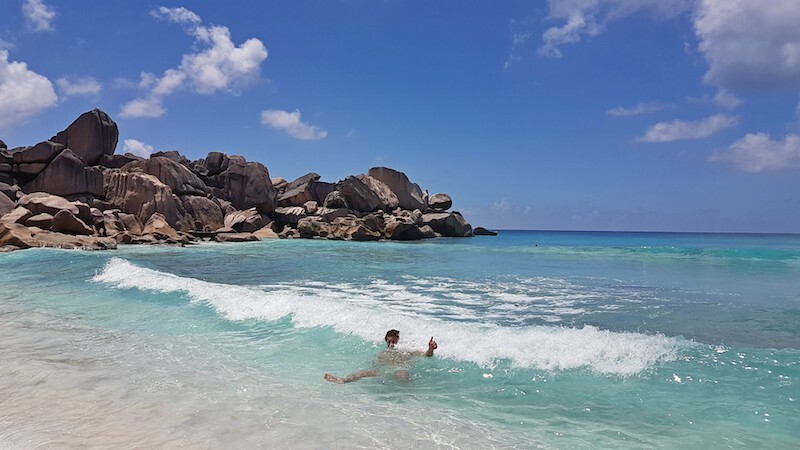 Hey Jamie – Honestly, with one week, I would either spend 4 nights on La Digue and 3 on Praslin or just stay on La Digue the entire time and take a couple of day trips to Praslin (it’s only a 15 minute ferry ride away). Doing all three in 7 days would be very rushed and this is definitely not a destination to rush around if you want to appreciate it! Thank you so much for the information and the quick response! I have decided to do a longer trip now! Can’t wait! Thank you! I am from India. Me and my wife are planning trip to seychelles in Feb’18. It will be a 10 day trip. 4 nights in mahe than we will go to La Digue for 2 nights and than last 3 nights in praslin. We are planning our own trip. Needed some guidance…if it’s feasible for u to have a conversation. My email I’d is [email protected]. plz mail me once…I’ll share my contact no. also. Hey Dutt – If you would like some trip planning assistance, you can contact me through my Contact page on the blog and I’d be happy to assist. I planned for Seychelles next week, my flight and accommodation (B&B) is already booked, I’m staying for 5N/6D. could you please suggest how much euro shall i carry for the trip? Will 800 Euros for 5N/6D enough for a couple? We want to do all the water sports activities as well (Snorkeling, diving , sight seeing etc). Any other suggestion would be helpful. Hey Roopak – If you are two people, you’ll need about 100 Euros per day for food and basic activities (one activity per day). This does not include accommodation. Also, if you move around a lot, from island to island, the cost will go up as the ferries cost up to 60 Euros per person one way for some routes. So 800 Euros should be okay if you don’t take ferries to different islands every day. Hi Derek, great post, man! I am with tickets already bought to Johannesburg on April and I am deciding to fly to Seychelles or Mauritius. Right now, I am more on the way to Seychelles, as me and my wife enjoy local food, sea food, more virgin places, have contact with locals and so on. It looks more Seychelles than Mauritius. 1) Are there food places close to these isolated beaches as we will need something for our baby´s lunch? 2) Did you have any diarrhea or other health problem there? 3) In average, how long you took driving/biking from your sleeping place to the beaches? 4) Would you recommend same itinerary if you were with baby this age? 1. There’s always food around. Even if you go to some of the more remote beaches, you can always stop by one of the small take-away restaurants and get a lunch to take with you. But most of the beaches have at least one restaurant nearby as well. 2. No health problems at all and we ate at plenty of local places. The standards on the islands are very high. 3. This depends on where you stay. On La Digue, there was a beach 5 minutes bike ride away, another 10 minutes away and a few that were 20 minutes bike ride away. 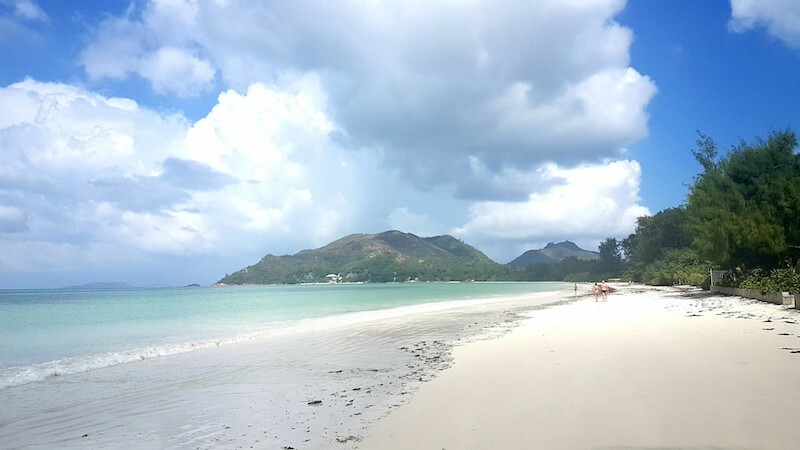 On Praslin, there were two beaches less than 5 minutes walking away and the other beaches were anywhere from 10 – 30 minutes drive away. Again, it depends on where you stay of course as you could be closer or farther from beaches, but you’ll never be too far from a beach, that’s for sure. 4. Definitely. It was all very easy and wouldn’t be a problem with a baby. 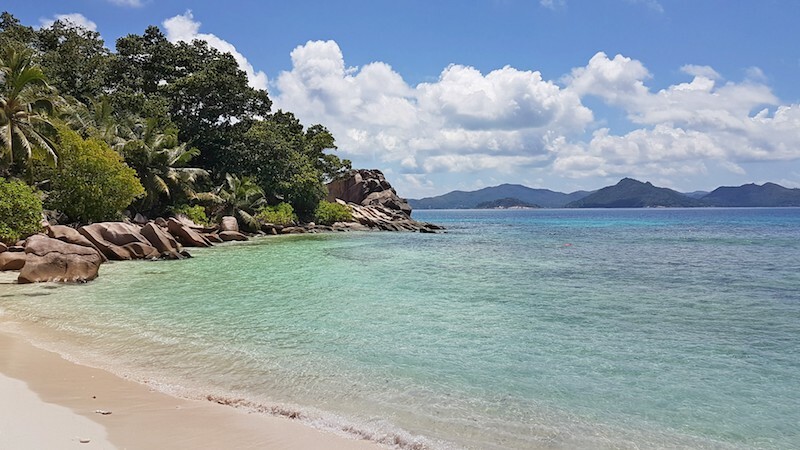 If you wanted to make it easier, you could just stay on La Digue and take a day trip to Praslin as the ferries leave often for the 15 minute trip between the two islands. Or you could take a catamaran trip from La Digue to visit a few beaches on Praslin for a day. But overall, getting around is pretty easy and our itinerary could be done with a baby. Thanks for the post! It had most of the information I was looking for. I had a couple of additional questions though, if you could help me with them that would be great! 1. Did you do water sports in seychelles? Things like scuba diving etc and how much did that cost you? 2. How much was the overall cost you incurred? 3. Did the local eateries or the takeaways had vegetarian options for lunch & dinner? Hey Aniruddha – Thanks for the message. We didn’t scuba dive while there. Things like snorkeling were around $30 USD more or less to give you an idea. As for the overall cost, to be honest, I don’t know but it’s possible to spend $50 USD per day or so if you stay in budget accommodation and take the local bus around. Yes, there were some vegetarian options, mostly salad, at the local eateries. They do eat a lot of fish and meat though so not a ton of options but there always was something. We’re going there next year in April, and on a tight budget. Was a bit worried about the cost, until I read your post. Thanks for all the helpfull info! Can I bother you with a few more practical questions during our planning process the next months, via email? That would be really helpfull! No problem Maarten. Just send me an email when you’re ready. Lovely pictures and great info! Thanks for sharing! I bet the seafood at seyshells would be pretty spectacular! Amazing!! Would love to plan my trip Seychelles. ‘Sounds like a dream. And not as expensive as one thinks. Those tips are great, especially staying at Guest Houses versus resorts or five star hotels. I am surprised that more people don’t apply that tip in general for all exotic islands around the World as it’s a great way to interact with the locals and eat their customary food. 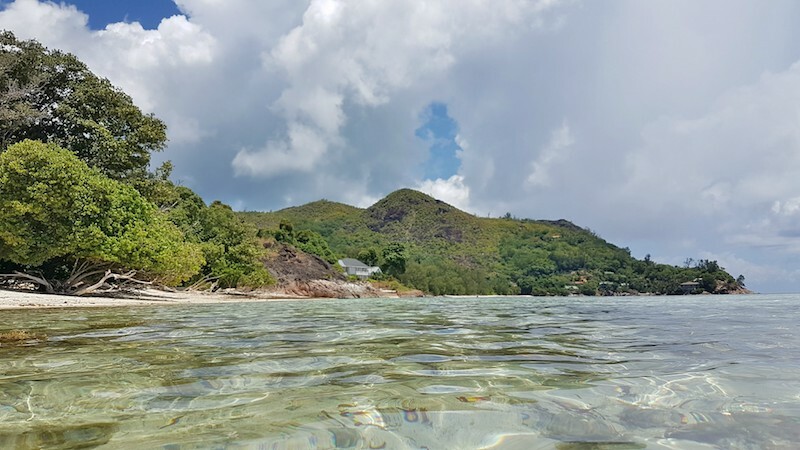 As for Mahe, was there anything on that particular island that you wish you had a bit more time to see for yourself or would recommend to others visiting to the Seychelles? 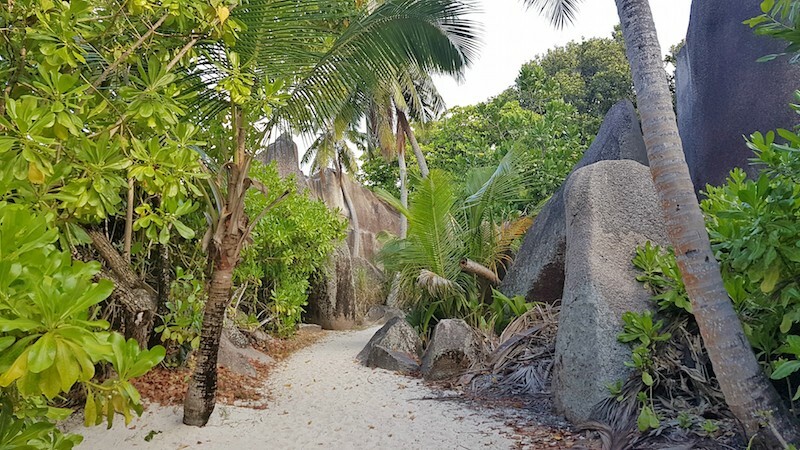 Like any old forts or museums that highlight that history of the Seychelles so you have a better understanding of the country while visiting it? Wow! such an exotic vacation that too within the budget. This is such an amazing piece of information. Thanks for sharing! What a great 40th birthday! ‘ wish you all the best all year! thanks for sharing this beautiful paradise, i’ll definitely go there someday. The pictures are so beautiful, you two had the beach paradise all to yourselves,really amazing! Omg it looks stunning! :O Really a paradise like you say. I really hope I can one day make it to the Seychelles. Enjoyed reading this post! Seychelles looks so damn amazing! Lovely clicks. Thanks a ton for sharing. Simply loved it. Any scooters for rent instead of cars? Hey Tom – On Praslin and Mahe you can rent scooters as well! Any thoughts on snorkeling? Can you swim out to a pretty reef from the beach? Hey Glenn – Plenty of snorkeling options. Even if you just walk into the water at some of the beaches, colorful fish start swimming all around you and the water is so clear that you can see straight to the bottom. And then there are reef areas for even better snorkeling that are easily accessible, either by beach or boat, on most of the islands! I’ve been lucky enough to visit 3 times as my boyfriend grow up there. Certainly not pocket friendly but undoubtedly the most beautiful beaches in the world! My favourite is Petite Anse on La Digue! Glad you had a great trip! Awesome post Derek. I’ve wanted to visit Seychelles for so long as well, this is some fantastic inspiration and information! Lovely descriptions and pictures of this truely special and amazing place! Incredible ! How is it possible you thought of this when you were so young. How did you learn of this place ! Thank you for sharing and I so look forward to more experiences shared! HaPpy incredible 40 years of an amazing journey! Wishing you many more ! Amazing! Would love to go there someday! Thanks you for sharing your beautiful pictures. Awesome pics. I would love to go their and see it all for myself! happy birthday! looks gorgeous! I heard there was only alcohol on the main island. is that true? for me, beach and cocktails go hand and hand. Hey Jessica – That’s definitely not true! Alcohol could be bought in almost every shop and restaurant I came across on all 3 main islands.